One of the hallmarks of Berkshire’s success has been its willingness to raise or lower its formidable cash hoard in response to the presence (or lack thereof) of viable investing opportunities. One of the other hallmarks of Buffett’s approach has been to tune out forecasts and de-emphasize the importance of them in general. The one thing Buffett has never given up on is the idea that American productivity, innovation and economic dynamism will always lead to substantially greater prosperity in the future. And he’s been right for decades, through all sorts of setbacks, crises and challenges for the nation. So if the choice is to be in the Buffett camp vs the David Stockman camp or the Peter Schiff camp, well, I regard that as no real choice at all. That formula has worked out well. Stay bullish on the belief of the dynamism of America, and buy good businesses when they become cheap. In a post-election interview with CNN, Buffett expressed confidence in the supremacy of the American businesses (click on this link if the video is unavailable). There is much to be said about the Buffett formula. According to Credit Suisse, US real equity returns has been the highest in the world. Though the stock market has experienced serious losses, prices have always come back. A value orientation, as proxied by a high price to book, outperforms the market. Buffett then couples the value discipline by buying companies with a moat, or a sustainable competitive advantage. The combination of buying value companies with a moat has been the secret of success. However, we may be reaching an inflection point for Buffett`s brand of investing. In the Age of Trump, the tailwinds on Buffett`s value approach may be coming to an end. This chart from BCA Research (via Tiho Brkan) tells the story. Buffett’s successful run coincides with the era of Pax Americana and rising global trade. What would happen if the growth in global trade were to come to a screeching halt? What kinds of stresses would the global economic system face? Value investing depends on valuation a mean reversion effect, or the tendency of cheap stocks to return to becoming more reasonably priced. 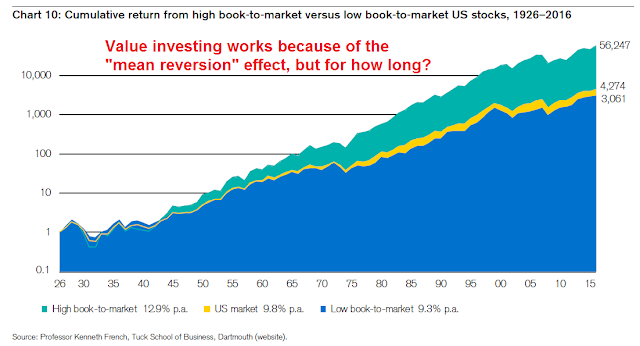 What if mean reversion were to stop occurring? What would happen to some of those business moats if global trade were to start shrinking? Trump has said he wants to include a clause in trade agreements that would allow the United States to get out within 30 days if the other country balks at fixing any problem that occurs. Last week, White House trade adviser Peter Navarro upped the ante by telling Senate Finance Committee members that the administration also wants to include a provision that would trigger a renegotiation whenever the United States runs a trade deficit with the partner country, Morning Trade has learned. CNBC’s Melissa Lee pointed to a Citigroup estimate that said this new tax would be a massive hit to company earnings. That means people working in retail would likely lose their jobs as companies try to cut costs. “Well, first of all, this is a false narrative and a fake study,” he countered. “Citigroup has no credibility,” Navarro said. He called the bank’s analysis, and analysis from the Peterson Institute for International Economics, “garbage studies and scare tactics” and compared them to media outlets like MSNBC and CNN. “We are not backing off,” he said. Lee pointed out that Citigroup isn’t the media — it’s research written for investors looking to find out if companies are healthy. Navarro ignored that point. Paul Ryan and House Ways & Means Committee Chair Kevin Brady know everything I just said and probably agree with much of it. They believe the BAT’s negative effects will disappear quickly due to currency flows. As the trade deficit shrinks, fewer dollars will flow from the US to the rest of the world. That trend will make the dollar rise against other currencies, thereby nullifying the higher prices we will pay for imported goods. Yet getting there constitutes a global shock of the first order. “This will trigger a series of emerging market crises,” said Stan Veuger from the American Enterprise Institute. He estimates that the burden for companies and states in developing countries with dollars debts will jump by $750bn. Turkish firms alone would face a $60bn hit. It does not end there. Studies by the Bank for International Settlements show that a rising dollar automatically forces banks in Europe and the Far East to shrink cross-border lending through the mechanism of hedge contracts. A dollar spike of anywhere near 20pc would send the Chinese yuan smashing through multiple lines of psychological resistance. The People’s Bank (PBOC) is already intervening heavily to defend the line of seven yuan to the dollar. Ferocious curbs would be needed to stop the Chinese middle classes funneling money out of the country if it crashed by a fifth. Junheng Li from Warren Capital says the China’s exchange regime is more brittle than it looks. Official data overstates the PBOC’s fighting fund by $1 trillion, either because reserves are “encumbered” by forward dollar sales or because they must be held in reserve as a “fiscal backstop” for Chinese firms at risk of default on dollar debts. She expects the system to snap at any time, and without warning. I strongly doubt whether the Trump-Ryan axis in Washington has any idea what could happen if they detonate a debt-deflation crisis in China, or if they ignite a short-squeeze on $10 trillion of off-shore dollar debt with no lender-of-last-resort behind it. Nor do they care. A surging USD from the imposition of a BAT could spark another emerging market currency crisis. This time, the world won`t have the benefits of rising global trade to cushion the blow. A useful way to estimate that value for a security you own is to ask yourself the question: what is the most you would be willing to pay for the security if you couldn’t ever sell it? Take the S&P 500 with its $45 dividend that grows at some pace over the long-term–say, 2% real, plus or minus profit-related uncertainty. What is the most that you would be willing to pay to own a share of the S&P 500, assuming you would be stuck owning it forever? Put differently, at what ratio would you be willing to permanently convert your present money, which you can use right now to purchase anything you want, including other assets, into a slowly accumulating dividend stream that you cannot use to make purchases, at least not until the individual dividends are received? When I poll people on that question, I get very bearish answers. By and large, I find that people would be unwilling to own the current S&P 500 for any yield below 5%, which corresponds to a S&P 500 price of at most 1000. The actual S&P trades at roughly 2365, which should tell you how much liquidity–i.e., the ability to take out the money that you put into an investment–matters to investors. In the case of the S&P 500, it represents more than half of the asset’s realized market value. Now, here’s where the parallel to banking comes into play. As with a bank, a market’s liquidity is backed by a network of confidence among its participants. Participants trust that there will be other participants willing to buy at prices near or above the current price, and therefore they themselves are willing to buy, confident that they will not lose access to their money for any sustained period of time. Their buying, in turn, supports the market’s pricing and creates an observable outcome–price stability–that reinforces trust in it. Because the investors don’t all rush for the exits at the same time, they don’t have a need to rush for the exits. They can rationally collect the excess returns that the market is offering, even though those returns would be insufficient to cover the cost of lost liquidity. The question comes up: in a low rate world, with assets at historically high valuations, offering historically low returns, what should investors do? Should they opt to own assets, or should they hold cash? The point I want to make in all of this is that to answer the question, we need to gauge the likely strength and sustainability of the market’s network of confidence amid those stipulated conditions. We need to ask ourselves whether investors are likely to remain willing to buy at the high valuations and low implied returns that they’ve been buying at. If the conclusion is that they will remain willing, then it makes all the sense in the world to buy assets and continue to own them. And if the conclusion is that they won’t remain willing, that something will change, then it makes all the sense in the world to choose hold cash instead. Now imagine that global trade starts to unravel and EM countries experience a currency crisis, which morphs into a global financial crisis. What happens to confidence then? If we want to get in front of things that are going to break a market’s network of confidence and undermine people’s beliefs that they’ll be able to sell near or above where they’ve been buying, we shouldn’t be focusing on valuation. We should be focusing instead on factors and forces that actually do cause panics, that actually do break the networks of confidence that hold markets together. We should be focusing on conditions and developments in the real economy, in the corporate sector, in the banking system, in the credit markets, and so on, looking for imbalances and vulnerabilities that, when they unwind and unravel, will sour the moods of investors, bring their fears and anxieties to the surface, and cause them to question the sustainability of prevailing prices, regardless of the valuations at which the process happens to begin. Under that scenario, would buying the dip work? Could Berkshire Hathaway depend on the moats of these companies that Buffett purchased? How many of those moats would be breached if global trade tanks? Could you depend on the resiliency of a leaderless capitalist system when America is no longer willing to be its leader? What happens to the political systems of the leading industrialized countries in the world? Do you still want to bet on mean reversion and the sustainability of business moats under those kinds of scenarios? This is why momentum style investing is a better approach to navigating an uncertain and possibly new future. 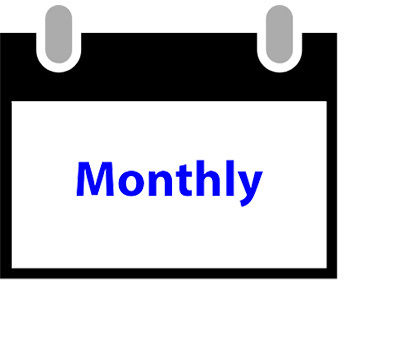 Just be aware that momentum strategies tend to be high turnover and may not be tax efficient for taxable accounts. Cam: the answer to your question, “Do you still want to bet on mean reversion and the sustainability of business moats under those kinds of scenarios?’ is yes. Because the United States and Canada are not Russia of the early 1900’s nor China in the 1940’s. 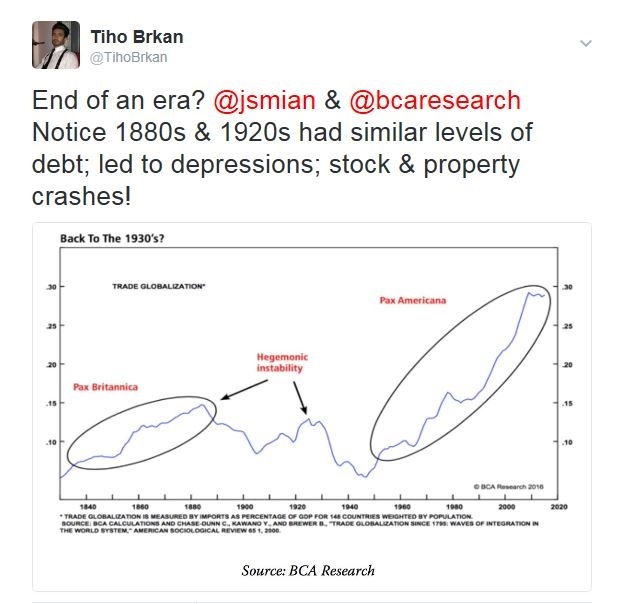 Even in the Great Depression markets eventually stabilized. If the trade off is no BAT no tariffs and a China that dominates Asia – militarily and economically – versus some form of BAT and/or tariff and a China in economic turmoil I’ll take the latter and take my chances. Ken: I really liked the earlier statement you made that momentum investing is great as long as you know when not to do it. That is great advice. I would say the the future USA also may not be like the old USA for many wide moat companies. Technology changes will be extremely disruptive and in many cases unexpected or at least surprising in how fast they rise. I live in oil country and technology changes have massively disrupted the industry. There is no reverting to a previous mean. I avoided the downswing of energy shares in 2014-15 using momentum and got back on board when it hit deep value at the turnaround in January 2016 (Cam was a big help when he put out a special buy near the EXACT low. Thanks Cam). Jeff, thanks. It was right to use momentum in 2015. 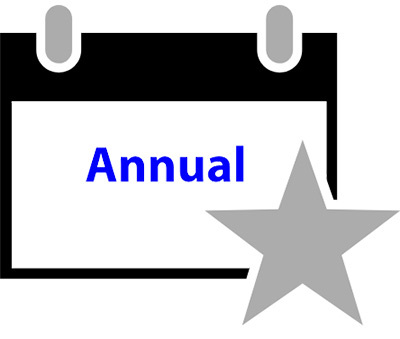 It was right to not use it so I could buy the deep value energy/commodity turnaround in 2016. BTW I sold all energy two Fridays ago. Momentum had turned negative. I fear shale drillers are adding to production enough to cap and likely undercut OPEC reduced production. Many old timers think this is just another good old bust and now boom recovery like the old days with a return to the old mean. From my knowledge of advanced the drilling and completely technology is advancing, that is wrong thinking. This recovery will play out differently. Just before the election Paul Krugman said the markets will “never” recover from a Trump victory. Equity prices have voiced their opinion of Krugman’s opinion. Trump has said a great many really, really, dumb things. However his cabinet appointees are stellar, and they speak their own minds. Everyone is looking through a microscope for Trump to actually do something dumb, he has yet to do it. So far the only thing I am seeing is a “good cop/bad cop” negotiation tactic, on a global scale…..
We are still in the same place as we are right after the election. We know that it does not matter what Trump says, because he’ll easily contradict himself the next day, and anyway he’s not interested in the truth. We do not know how his economic policy will be, because his administration has diametrically opposed views. We know — and I think this is Cam’s point — that if Navarro wins the fight and it’s Protectionist Trump we are looking at, then all bets are off. If there is no more Pax Americana and no more globalist U.S., then Buffett’s premise is no longer 100% valid. Thanks for writing a fairly significant macro (economics) article. You have summarized a lot of cascade type events that may unravel with the current US policies that are being floated. I recently returned from one of the large Emerging Markets and a friend of mine who works for a major German engineering company told me that the German company had a last minute cancellation of major assembly line contract from one of the US auto makers. I also heard similar chatter from software companies that rely heavily on the H1B visa program. This is chatter on the ground floor that has not yet made it to the newspapers. By the time it hits the news media, it is usually too late. Ken is right, enjoy the momentum/music, but get out well before the music stops. Your article serves a sounding/warning board of what could be a domino effect with protectionists and pro nationalist policies that we may be facing going forward. Thanks again for showing some of the historic precedents though, such precedents (Russia, China, Germany) had backdrops of revolutions and war. Granted, we may not be peering into a war type back drop (like Russia, Germany over the past century), but we may may be seeing the start of a “revolution” led by anti-gobalisation, pro nationalist moves from the US. If the $ is a counterweight to assets (like stocks, gold, bonds, farmland, commodities, income generating real estate, artwork etc. ), your article does serve sufficient warning to be invested in the safe harbors of the $, and under investing in “assets”. It would take a major loss of confidence for such scenario to unfold, but as history shows major turns in history start with a small spark somewhere (e.g. WW1 started with a minor event). Today’s 9pm speech by Trump may be just that small spark. The world remains awash in extreme (leveraged) liquidity, which may evaporate very very quickly if the $ strengthens. So far, the $ index has been tame (below 102), but one to watch going forward. Marin Lepen’s victory in France in the next couple of months may be the next nail in the coffin of the EU. Yes, lot of dark clouds on the horizon, starting tonight, 9 pm US, eastern standard time. The US Fed is bent on raising interest rates. This is going to increase debt servicing costs globally. Furthermore, the Fed also wants to shrink its balance sheets. How, is another matter. It all points to a shrinking $ liquidity globally. If it shrinks gradually and in orderly fashion things may be fine, but watch out if there is a rabid loss of $ liquidity. Your warning through this article is well taken, so, thanks. To a certain degree I think Trump and his supporters have a point about the media. The media (and I for that matter) zoom in on his character and his not-politically-correct babble. We also hear more about international politics than about his business-friendly American-centric moves. The huge leap in consumer, business and investor confidence statistics tell me that those folks are listening to his economic message and sheer gusto to make America more prosperous and add good jobs. They don’t care about his tweet about Meryl Streep. BTW I love her work. i will try to hear his economic message tonight as I hold my nose on his trampling of American values. That will help my investing win rate. It appears that Trump the man is well known to the voting public. What we are waiting to find is Trump the president.